Pardon the cliché, but today reminded me why in rushing, the early bird gets the worm. Sure, it’d be nice to sleep in a little longer and it would definitely be better to stay indoors another hour on a drizzly day, all to show up at the box office right before it opens and chance your luck. But taking the question of “am I going to get a ticket?” out of the equation is far more worth it. These are the choices I made when I rushed A View From The Bridge. 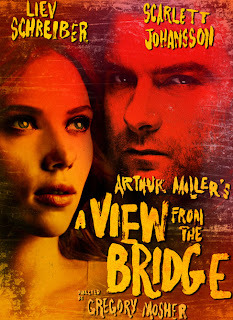 Just like A Steady Rain, which boasted two huge Hollywood names, people are coming out in droves to see Scarlett Johansson and Liev Schreiber in this revival of the Arthur Miller play. Last week, it sold 102 percent of its tickets! Being that there are only six weeks left to the production’s run and I was well aware of the demand for this show, I decided to be very cautious with this rush. I’m honestly shocked that Bridge has a rush policy at all, with the rate they’re selling. It’s a general rush that goes on sale when the box office opens for $26.50 a piece, up to two tickets. I arrived at the Cort Theatre at 8:30 a.m. and was the third person in line. The Cort has a nice, large overhang that sheltered us from the rain. Once 9 a.m. hit, the rush line grew fast, eventually adding up to about 30 people. I could tell the rushers that were beyond tenth in line were getting antsy as to whether they would be getting a seat. People even began querying the front section of the line, asking who was purchasing tickets for the matinee or the evening show. It was then that I was content with my decision to get there early, because I knew I was getting a ticket and didn’t have to worry. It was a comforting thought, and made for a very easy rush. The payoff was even larger when I got my ticket, which was for a front row orchestra seat on the aisle of the center section. I thought it was a mistake at first! The idea of seeing Johansson and Schreiber perform that close was incredibly exciting. It turns out, the front row of the Cort is extremely close to the stage, which is also quite high. But luckily, the actors stand further upstage for most of the show, so they were visible. I didn’t need a giraffe neck like I thought, after all. A View From The Bridge paints the portrait of a man, who once called all the shots, now losing control of the people around him. The man with the waning influence is Eddie Carbone, a surly longshoreman (Schreiber) at a turning point in his life. His niece Catherine (Johansson, in her Broadway debut), who he has raised since childhood, is now a young woman on the brink of independence. There is a disconnect between he and his wife Beatrice (Jessica Hecht), and she is often on his case. And the arrival of two illegal immigrant cousins of Beatrice’s from Italy throws a wrench in the dynamics of Eddie’s cramped Red Hook, Brooklyn apartment. When the youngest cousin, Rodolpho (Morgan Spector), falls in love with Catherine, it’s all Eddie can stand. His unraveling gives way to unjustified intolerance and an eerie obsession with his young niece. Director Gregory Mosher’s pacing of the play is fantastic. Bridge feels like a pot of water on the stove, steadily heating to a boil. The stove’s heat is brilliantly facilitated by Schreiber’s incredible talent. His on-stage presence is magnetizing. Eddie becomes a monster, but what is important here is that Schreiber succeeds in beginning Eddie’s story as a sincere, kind-hearted man of few words. This way, we are able to see the story as a tragedy. He is overprotective, but he cares deeply for Catherine, and the first few scenes of the play really demonstrate this. Yet in each scene, Schreiber makes calculated decisions that steadily reveal the power-hungry beast that lies within. It’s a rich character, one that deals with struggle for control, blind intolerance (which hints at homophobia, regarding the character of Rodolpho), and the battle to maintain one’s loyalty. It’s heavy and delicious, and Schreiber is so up to the task. Every moment he is on stage, there are subtle layers and subtext he is injecting into his performance. Although I am constantly underwhelmed by the film roles she chooses, Johansson was fantastic as Catherine. Even though it is a key role, there are large portions of the play where all Catherine has to do is run from room to room excitedly. But in her spotlight scenes, Johansson comes alive with a light I have never before seen from her. Her voice and delivery are scratchy and filled with the working-class mentality of Catherine’s nature. If I closed my eyes, I would have never guessed it was Johansson speaking. Because her character doesn’t get the shaft in this play, Johansson is able to reveal true depth as Catherine. Although she is not perpetuating the foreboding events that stack up during the play, she is not completely innocent either. In scenes where she is told she needs to act like more of a woman in front of her uncle and distance him, and in one where she questions this advice completely, she shows both inner conflict and the fire of her convictions. It’s an attractive aggressiveness from Johansson, which I hope to see more of in her film work. 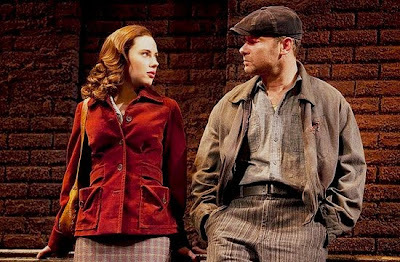 Even though Schreiber takes top-dog acting honors in Bridge, Hecht delivers a deeply moving performance as his strong and appealing wife. The entire cast’s dialect is top notch in this production, and Hecht and dialect coach Stephen Gabis have created a Beatrice who conveys painfully earnest pleading mixed with a simple woman’s sensibility. Hecht’s Beatrice is the wisest person in the show and her performance is nothing short of endearing. She is a simple woman from an extremely humble background, so when she speaks, she does so with no false allusions of where she’s been in her life, and yet Beatrice holds all the solutions of the play. Of course, no one takes her advice, and that is what makes her character all the more moving. The look of the play is sharp, perhaps even literally. The Brooklyn alley that the Carbones live on is presented as at a dramatic angle, rather than straight on from one end of the stage to the other. The same is done for the Carbone apartment. John Lee Beatty’s design never fails to be visually appealing, and the rusty, red color scheme adds a sense of eeriness and danger to Miller’s Brooklyn. Jane Greenwood’s 1950s costumes are flattering to all the actors, yet all exist on a muted path, as all these characters are from modest financial standings. It is Tom Watson’s hair and wig designs that are a misfire. In all cases, I could easily see the line on the actors’ foreheads where their wig caps ended and their real skin began. Johansson’s hair never passed for authentic and Spector sports an embarrassing blond dye job. The play is gripping the whole way through, although I was expecting an ending that had more of a surprise. True, it is a climactic and emotional conclusion, but I anticipated a more jaw-dropping twist. I also could have done without the narration of the lawyer Alfieri (Michael Cristofer), which felt like unnecessary audience handholding. Ultimately, the performances are stellar and propel this engaging story at an exciting pace. Most refreshing is that this is a production with Hollywood star power where the big names actually sweat, rather than just sit in chairs and deliver monologues. There is real elbow grease being displayed here, and I for one respect the likes of Johansson a lot more for it.